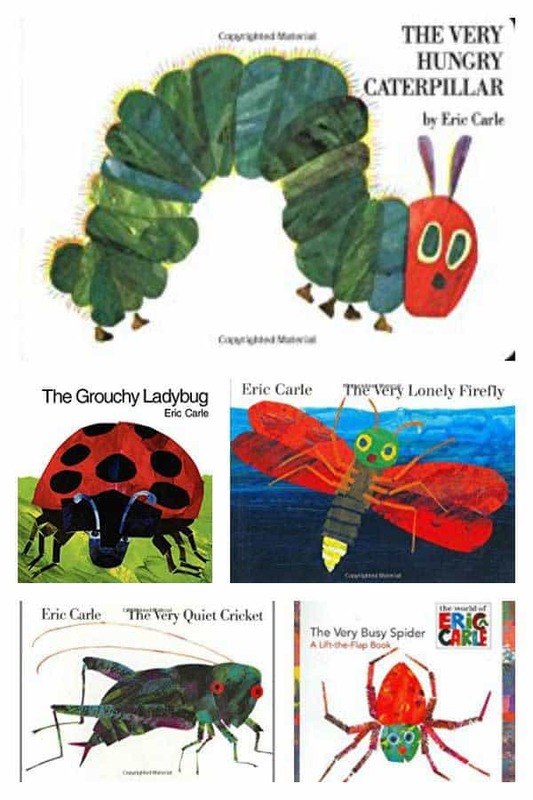 One of my favourite children’s authors and illustrators has to be Eric Carle. I love the way that art, colour, and words combine to create books that are perfect for reading together with your young children. There are so many to choose from though from the classic The Very Hungry Caterpillar through to less well-known books like How to Catch a Star or The Tiny Seed. When my children were toddlers and preschoolers we must have raided the library of every book that we could find written and/or illustrated by Eric Carle so I’ve put together our favourites to share with you. Where we have activities related to the books I have also included those so that you could extend the reading into play, learning, and crafts. We have included affiliate links to the books on this list – if you make a purchase through the link we may earn a small commission. I have tried to divide the books into different topic areas so that you can find the perfect Eric Carle Book for the theme that your toddlers and preschoolers are interested in. But these books work throughout the year and are lovely to read together anytime. My all-time favourite Eric Carle Book is The Very Hungry Caterpillar – I remember having this read to me as a child, my brother and I had a pop-up version and at the end of the story the “beautiful butterfly” popped out of the book after emerging from the cocoon. 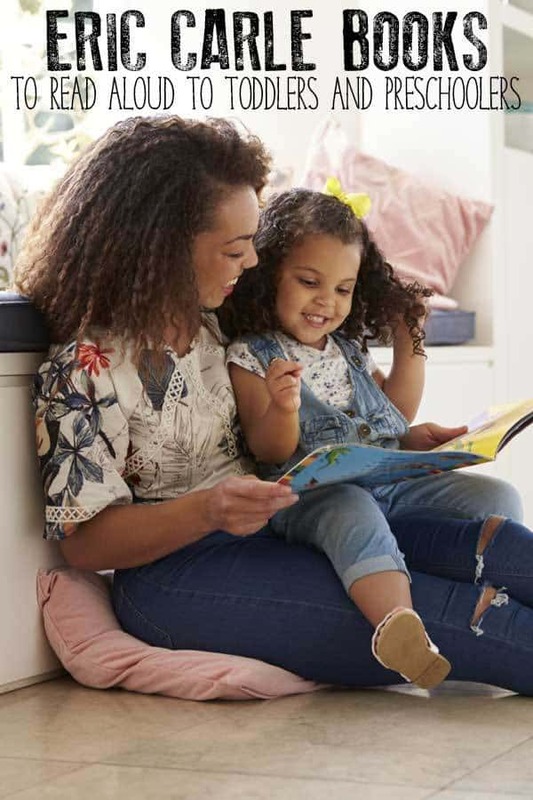 Inspired by The Very Hungry Caterpillar books and Activities check out our recommendation for more Bug and Butterfly Books to read together with your toddlers and preschoolers. Another favourite of mine is The Very Busy Spider – we love watching spiders weave their webs and this story is such a great one to read aloud with your toddlers and preschoolers. Although I tended to read it in the autumn it is ideal to read any time of the year. In many of the Eric Carle books that we have included in this list of recommendations, there are interactive elements for children to engage them further in the books. In The Very Quiet Cricket, there are sounds – this is a lovely book and one that we read when my eldest was a toddler and then used it for inspiration to head out on a bug hunt around the garden. My daughter has one animal that she can’t wait to see thanks to our reading of Eric Carle books a firefly. They aren’t easily found where we live and she really wants to find one thanks to reading The Very Lonely Firefly. I love the story and we have featured the book as one of our books during the Storybook Summer Series of book based activities for kids – Egg Carton Firefly. Whether you pick up a US version or a UK version of this book you have a great book to read together. The Grouchy Ladybug or The Bad-Tempered Ladybird is a book with a message about being kind and nice and how much better off you will be when you are nice and kind to your friends than when you are not. Written by Bill Martin Jr but illustrated by Eric Carle Brown Bear, Brown Bear, What do you See? was a great read aloud book when my two were young toddlers for learning colours. We used to read it together and then I would challenge them to find me objects around the room for each colour in the book. This was fantastic when I had a newborn and a toddler as the toddler would allow me to feed the newborn after we had read the book together as he was off hunting for the different coloured objects. Based on this same idea Polar Bear, Polar Bear, What do you Hear? and Panda Bear, Panda Bear, What do you See? are great for following on the theme from the Brown Bear book. It will also help to reinforce language as they follow the same pattern and use similar words throughout. I remember reading Mister Seahorse with my children when one of our good friends was pregnant – their shock at discovering that it wasn’t Mrs. Seahorse that was having a baby but instead it was Mister Seahorse. As a marine biologist, I loved this story and it was one that after we borrowed it from the library I went out and brought to add to our bookshelves. There is something that I love about Eric Carle books and that is the message that is told through the tales in A house for a Hermit Crab the crab learns that new things are good and that’s it’s alright for things to change. This is a great message to read aloud to children and particularly if they are going through a tough time say moving house, to a new group or new school. Now, why am I including a book about Rubber Ducks in our section on Animal Books by Eric Carle – because in 10 Little Rubber Ducks as they ducks go on their journey after falling off the side of the boat they encounter lots of different ocean animals from whales to dolphins. Combined with the language used this is a fun read-aloud that engages and connects with children teaching them maths, biology, and geography at the same time. Discover more Ocean themed books for Toddlers and Preschoolers to read aloud together. When I asked my eldest which was his favourite Eric Carle book there was a resounding The Mixed-up Chameleon. I remember taking this on trips with us when he was a preschooler and sitting on the plane reading it over and over again to him. He loved the way that the Chameleon got mixed up and the different animals that ended up making the Chameleon. I loved the message at the end of the story though. Having lived in the rainforest for 3 years and had a rescued Sloth as a companion in that time I couldn’t wait to read “slowly, slowly, slowly” said the Sloth to my kids and I wasn’t disappointed. Introducing the rainforest this amazing story lets you and your children have a little glimpse at the life of the Amazon rainforest and the fascinating creatures that live there. Read some of our Jungle Books for more Rainforest inspiration for toddlers and preschoolers. Focusing on the cat family in Have you Seen my Cat, Eric Carle takes you and your child and on a journey through the different species of cats as a little boy hunts for his lost kitten. From lions and tigers to your cat that sits infront of the fire at home this is another beautifully illustrated book to read together. 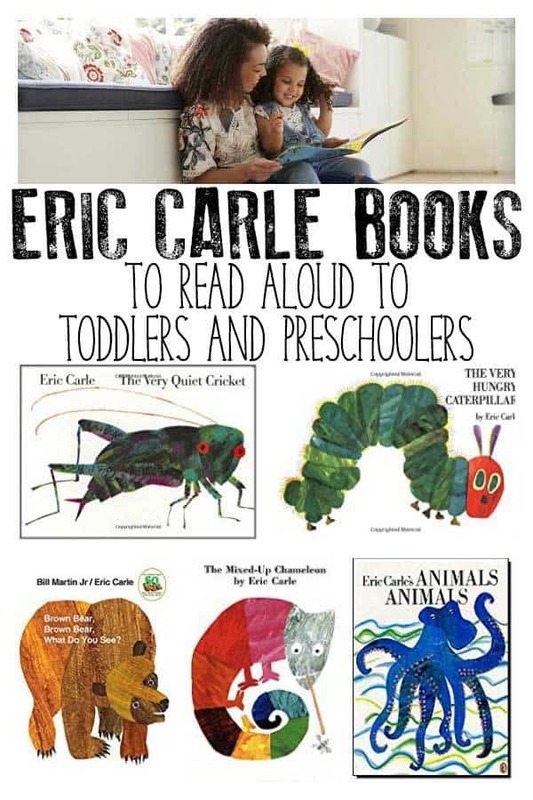 Poetry and Rhymes are a great way to develop language skills in children – in Animals Animals Eric Carle takes poems from famous writers and poets and adds his own flare with the illustrations to illustrate these fantastic classic poems for kids. Get moving with the animals in From Head to Toe a fun book that takes you through a journey with the animals and your body. Strech your neck like a giraffee or wave your hand like a monkey and have fun together. It’s a great book for getting your child to follow instructions – imagine a book like Simon Says. In this simple book Do you Want to Be my Friend take a tour through the different animals as the little mouse asks various creatures to be it’s friend. This book is ideal for younger toddlers rather than some of the others which will work with preschoolers and oldr children too. 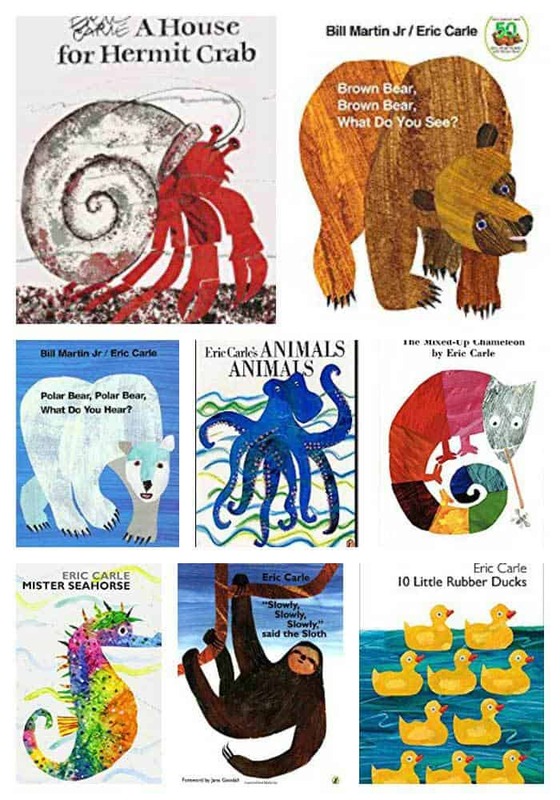 Although a lot of the Eric Carle books have ideas that you can learn with there are some that really stand out for learning about certain concepts. I brought Eric Carle’s ABC book for my children when they were little to help us read and learn our alphabet and letter sounds. As they loved the illustrations in the other books we had read I knew that this book would go down well with the children and it was ideal to read together and help them to start to recognise the letters and the names and sounds they make. 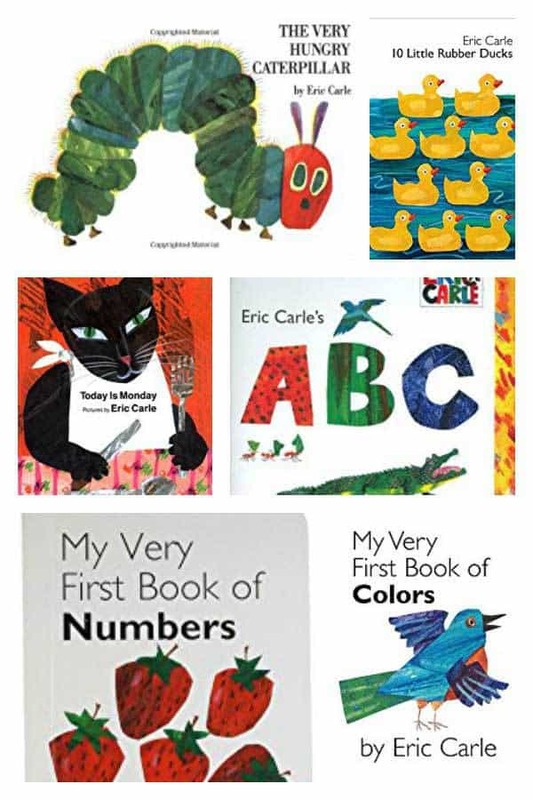 As well as the ABC book we also got My Very First Book of Numbers by Eric Carle and I would spend a lot of time counting out the objects on the pages as well as pointing to the number on the page helping my children to learn to count as well as recognise the numerals. With so many beautiful colours used in Eric Carle’s books I knew that this book My Very First Book of Colors by Eric Carle was going to be vibrant and colourful and ideal to read together with my children and learn some colour names and it didn’t disappoint. The days of the week can be a concept that children find abstract and a little strange – but by reading together Today is Monday and The Very Hungry Caterpillar these books help you and your children work on the names of the days as well as the order of the days in the week. With so many books to choose from outside of these topics there are a few others that I would recommend and love to read aloud to my children and have used in classrooms. Learn a little about how plants grow and what they need to grow as you read together The Tiny Seed. I add this book to our Spring Nature Table and bring it out throughout the spring and summer as we plant seeds, look for dandelions that take the breeze and grow our own flowers and plants in the garden. Find some quick plants that you can grow with kids after you have read The Tiny Seed by Eric Carle. Another one that we add to the Nature Table at different times of the year and when we focus on looking up instead of down on the ground for our nature journals. In Little Cloud the cloud journeys and becomes the different shapes in the sky – it’s great to read together and then take a moment to lay down and look and see what you find in the sky yourself. I have used it as a starting point for creative writing as well as to introduce different cloud types and formations when looking at the weather with slightly older children too. When we looked at artists when my children were preschoolers and I asked them for a famous artist they both said Eric Carle. In two of his books – The Artist that Drew a Blue Horse and Draw me a Star Eric Carle takes art a step further and creates tales around it. Discover how we drew our own stars with our homemade scratch art paper and also our exploration into Eric Carle as an artist trying to recreate his style of pictures. Learning to overcome problems with problem solving is important for children and in Papa, please get the moon for me the father overcomes a problem. For preschoolers and older kids this is a great book to read together especially when they are facing something difficult and challenging, as although it may not provide the answer it does show that solving any problem is possible. Last recommendation from me is Dream Snow – it’s a fun Christmas Book to read together with your kids and a worthy addition to your Christmas book Collection especially if you love the style of writing of Eric Carle and/or his illustrations. More Christmas Book Recommendations for your Toddlers and Preschoolers. 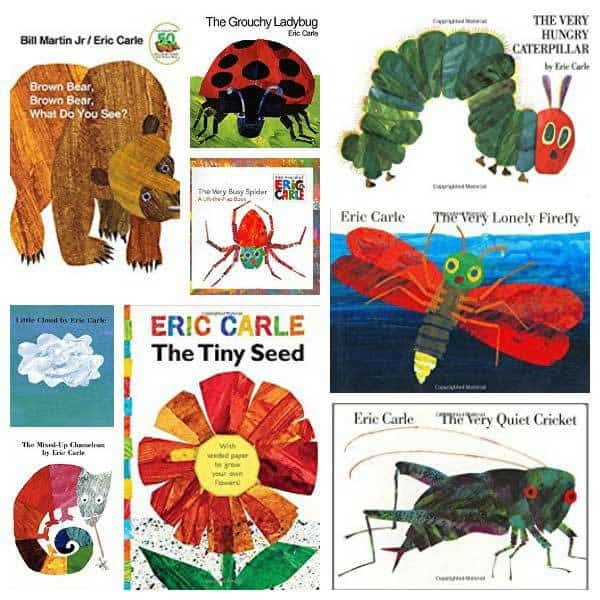 There are many other books by Eric Carle, however these are ones that I found especially good to read aloud with my toddlers and preschoolers and were the ones that we read together multiple times. I think we have read nearly all of his books now – my favourite is ‘The Very Quiet Cricket.’ There is also a DVD of The Hungry Caterpillar that has some other stories too – the animation is still Eric Carle, and the words, so it is lovely to sit down and watch as an adult too!